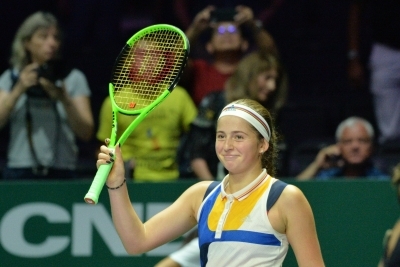 Singapore, Oct 26 (IANS) French Open winner Jelena Ostapenko was eliminated from the BNP Paribas WTA Finals tennis tournament in Singapore on Thursday, despite defeating third-seeded Caroline Pliskova. The 20-year-old Latvian, who beat the Czech Republic’s Pliskova 6-3, 6-1 in an hour and six minutes, left the tournament because she had been defeated by the United States’ Venus Williams and Spain’s Garbiñe Muguruza in previous White Group matches, reports Efe. “I lost my two matches here but it is my first time (in the WTA Finals) and I am really happy to be here… I think it is great to finish the season this way,” Ostapenko said after the match.